Oral cancer is something the team at Lockhart Dentistry in Indianapolis, IN doesn’t take lightly. Any patient can be at risk—not just those who smoke, use tobacco products or drink alcohol excessively. In fact, as per WebMD, more than 25% of all cases of oral cancer occur in non-smokers and those who are occasional drinkers. It is important to be screened for oral cancer regularly because the first signs of something being wrong may not be detectable by the naked eye and there may be no indication that there is anything to worry about, such as pain,pressure, bleeding, sores, etc. According to The Oral Cancer Foundation, approximately 53,000 people will be diagnosed with some form of oral cancer this year in the U.S. Additionally, one person every hour of every day will die from oral cancer. Since April is Oral Cancer Awareness Month, being well-educated on the topic is not only timely, but could save your life. Here is what you need to know about oral cancer, from the symptoms to the solutions. Where can oral cancer be found? Oral cancer can occur anywhere in the mouth. This includes the lips, cheeks, gums, tongue, hard palate/soft palate, floor of the mouth, sinuses, and the throat. There are a variety of symptoms that can indicate signs of oral cancer. While the very first signs may not be easily spotted, later stages are more evident. 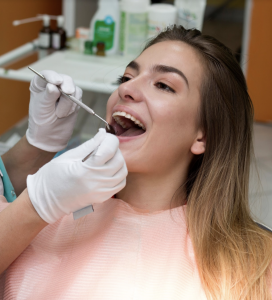 Here at Lockhart Dentistry, we emphasize the importance of early detection, and use high-tech devices to locate any early signs of oral cancer. (More information about our use of VELscope® technology below). While your exam at the office will provide in-depth screening, there are more obvious indications that oral cancer may be developing and growing. If you notice any of the below symptoms*, contact our office right away so we can assess what’s going on and if the issue is, in fact, a symptom of cancer. Why is early screening important, and what will my screening entail? Early screening is essential. The sooner the cancer is detected, the sooner the treatment can begin. If caught early on, the better the chance of removal, remission, and survival. When left to linger, the growth can spread to other areas of the mouth or further throughout the body. Make it your mission to be screened regularly at your dentist’s recommended intervals, and always check your mouth in the mirror, even if you don’t feel or notice anything strange. During your dental exam, Dr. Lockhart will inspect the inside of your mouth completely, as well as feel for any lumps or irregularities. But not every case can be seen with the naked eye. That’s where our use of VELscope® comes in. This painless and quick process is revolutionary in how it can spot signs of cancer with powerful precision. The VELscope® Vx Enhanced Oral Assessment System is a wireless scope that allows dentists to view oral abnormalities with great enhancement by way of natural tissue fluorescence. This award-winning device makes screenings far more efficient and effective as it allows Dr. Lockhart to spot anything suspicious, he would not have otherwise seen. Once the cells in question are biopsied and confirmed to be cancerous, there are various courses of action to consider depending upon the issue and severity. Generally speaking, the growth will be surgically removed. If needed, the patient will receive radiation therapy, chemotherapy, or a combination of the two. Follow up exams will be crucial to keep up with, in order to watch for any signs of recurrence. To prevent oral cancer, consider proactive measures to lower your risk. Refrain from smoking or drinking alcohol excessively. Protect your lips with lip balms containing sunscreen. Maintain a healthy diet and lifestyle. Get screened. Stay on top of your overall oral care. Perform an examination of your own mouth and if you see something, share with your dentist as soon as you can. While April is Oral Cancer Awareness Month, every day is a chance for you to practice self-care. It doesn’t take very long to inspect your mouth. Do it before or after brushing, while you are already focused on the area. Your mindful observation can be the key to early detection. If you have any questions or concerns about oral cancer, discuss them with Indianapolis dentist Dr. Lockhart at your next appointment or give us a call at 317-449-8039.